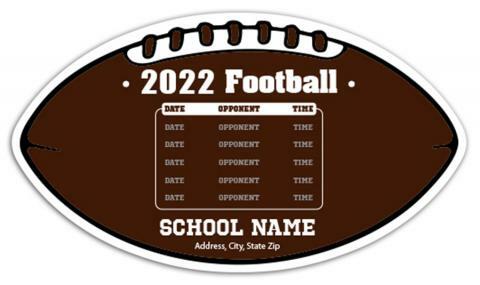 Personalized 7 x 4 sport schedules football shape magnet becomes a true companion of cause, if you wish to promote your school team or local football team. Ideal for school sports teams, school management, sports academies or sports marketers trying to cash from the season in progress or boosting the team spirit. Attractive price benefits can be availed on bulk orders of this football shape magnet and marketers can enjoy heightened brand equity, too. This football shape magnet can be gifted individually or along with some purchases or as an appreciation token during school fundraisers, etc. Request a quote to know discounts that you may avail on wholesale custom 7x4 magnet sport schedules football shape magnet.